The semi-arid regions of the world are marked by socio-economic disparities and environmental vulnerabilities. The intensification of the land use change implies a necessity of a better knowledge of the of water use and food production to improve crop water productivity for rational water resources planning. 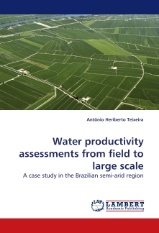 This work presents an overview of the key concepts involved in water productivity analyses from field to regional scales in areas with quick land use change. It is emphasized the use of tools for estimating spatially distributed water related variables to describe the water cycle in irrigated agriculture under semi-arid conditions with some applications in the Northeast Brazil. Moreover, they can be operationally implemented to monitor the intensification of agriculture avoiding the adverse impact on downstream water users. Conclusions and recommendations are given to improve the evaluation of irrigation in large areas in terms of crop water productivity and their impacts on water resources, by the intensification of irrigated agriculture.